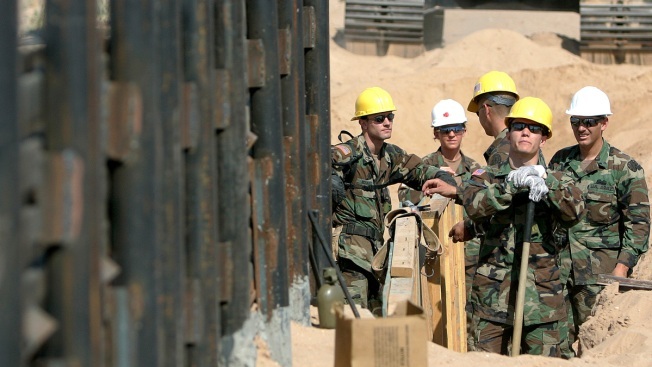 In this Monday, June 5, 2006, file photo, Utah National Guard troops from the 116th Construction Equipment Support Company, the first National Guard unit along the border as part of Operation Jump Start, prepare to extend a wall along the U.S.-Mexico border in San Luis, Ariz. In 2018, the U.S. National Guard faces a vastly different environment than it did on its last two deployments to the border with Mexico, with far fewer illegal crossings and more Central Americans than Mexicans coming. The U.S. National Guard faces a vastly different environment than it did on its last two deployments to the border with Mexico, with far fewer illegal crossings and more Central Americans than Mexicans coming. Since then, crossings have shifted to Central American women and children crossing in Texas' Rio Grande Valley, many who turn themselves in to authorities and seek asylum or other protection. Mexicans accounted for only about 4 of every 10 arrests last year, down from about 9 of 10 during the Guard's previous deployments.